THREE MEN HAVE been arrested by gardaí after a search was carried out on a house in Letterkenny, Co Donegal this morning. The three men – aged 24, 25 and 31 – were detained as part of an ongoing investigation into a Romanian organised crime group, gardaí have said. 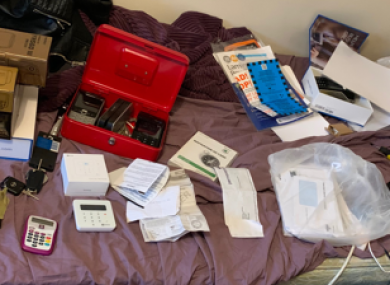 A large amount of fraud paraphernalia including suspected cloned credit cards, credit cards issued under false names and bank account details were found at the house. False Romanian identity documents, credit card machines, till rolls and a number of suspected stolen Irish and UK passports were also recovered. Driving licences along with two cars bought with money obtained on bank accounts opened under false names were discovered at the house and seized by gardaí. “Much of the documentation seized relates to suspected frauds in Northern Ireland,” gardaí said this evening. The search was conducted by members of Garda National Economic Crime Bureau, National Bureau of Criminal Investigations and was assisted by local gardaí from Letterkenny and Milford. Investigations, including enquires with Europol and the PSNI, are ongoing. The three arrested men are currently being detained under Section 50 of the Criminal Justice Act 2007 are being held at Letterkenny and Milford Garda Stations. Email “Three men arrested as part of investigation into organised crime gang ”. Feedback on “Three men arrested as part of investigation into organised crime gang ”.